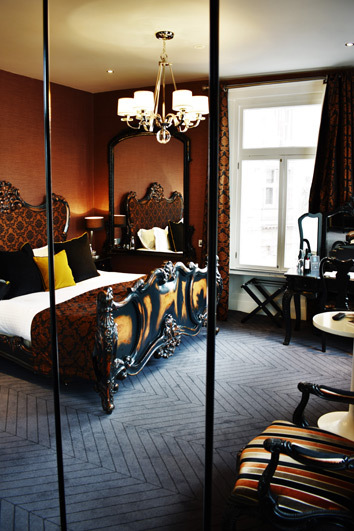 Twelve individually designed guest rooms are the epitome of glamour combining baroque with a contemporary edge. Each room comes with the latest in-room technology including wireless high-speed Internet access (Wi-Fi), apple device docking stations, fully stocked mini-bar, GHD hair straighteners, in-room safe and wall-mounted flat screen colour TV. Complimentary homemade traditional Scottish shortbread on arrival, daily newspapers, Nespresso coffee machines decorate every room or enjoy designer teas as well as incredible views of Edinburgh Castle are all part of The Rutland Hotel experience.